Anna Torv talks to Dazed about working with David Fincher, learning about psychopaths and training herself not to please people. When it was announced that American director David Fincher – of Se7en and Zodiac fame – was working on a new TV show for Netflix, focussed on the psychological profiling of serial killers by the FBI in the late 1970s, expectations were inevitably high. But as almost anyone who has binge-watched Mindhunter in the three weeks since its release will tell you, it’s even better than anticipated. Based on the book of the same name by criminal profiling pioneer John E. Douglas, and masterfully adapted for the small screen by playwright Joe Penhall, season one is a slow-burning, sultry and sinister watch, that holds you transfixed from start to finish, driven by its flawless performances and stylish 70s noir aesthetic. At its helm is Holden Ford (played by Jonathan Groff, and based on Douglas), an ambitious young FBI agent who becomes fixated on the idea that the new era in which America has found itself – post-Nixon and the Vietnam War – requires new methods of criminal investigation. Previously, the FBI’s main concern was catching killers and bringing them to justice, but Ford wants to understand them – why they do what they do, and why they do it how they do it. And it turns out he’s not the only one. He soon meets the gruff but inherently likeable Bill Tench (Holt McCallany), the veteran agent behind the FBI’s behavioural science unit, and between them they come up with a radical idea: to conduct interviews with America’s most notorious, imprisoned serial killers – cue chilling turns from Cameron Britton as real-life beheader Edmund Kemper and Happy Anderson as foot fetishist Jerry Brudos. Add to the mix Professor Wendy Carr (Anna Torv), a revered psychology expert at the University of Boston who lends academic gravitas to their endeavours, and the team is complete – given the green light to conduct an ongoing profiling operation, in secret, from the basement of the FBI headquarters in LA. Unlike Ford and Tench, however, whose home lives are deftly interwoven into Mindhunter’s plot, season one offers little insight into Wendy’s personal existence, save for the fact that her work is her raison d’etre, and that she is a lesbian, something she refuses to acknowledge publicly, except among close friends. Here, as we impatiently await confirmation of a second season, we sit down with the talented Torv – best known for her role as quick-witted FBI agent Olivia Dunham on J.J. Abrams’ sci-fi cult series Fringe – to hear more about working with David Fincher, her investigations in sociopathy, and bringing Wendy to life. You say that Wendy is inspired by rather than based on Dr. Ann Wolbert Burgess, but did Burgess’ work help you to develop Wendy’s character? Anna Torv: Ann is an amazing person, but I’d do her a disservice to say she informed Wendy’s character. One of this things that I did carry with me, however, is that her focus has been, and still very much is, on the victims, and so is Wendy’s. She is hopeful that her work can help these things be prevented and can teach potential victims the signs to look out for, and the techniques for dealing with them. Are there many examples of women FBI employees at this time that you could look to for reference? 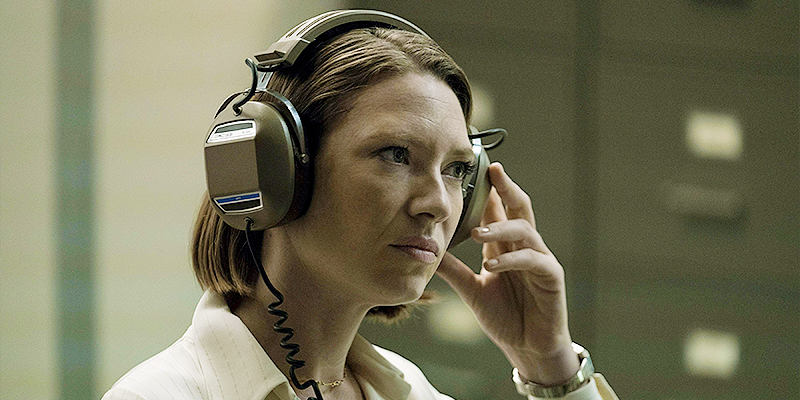 Anna Torv: No, it was quite scarce but I didn’t really look into any of that specifically because Wendy isn’t an FBI agent – she’s an academic, essentially, so it was the academic side that I really focussed on. I did look into the killers initially and then I thought, ‘I don’t want to look at this any more, it’s just too creepy,’ so then I started investigating the psychology behind the crimes – is it nature or nurture? What are the signs of each? What was your favourite fact your learned during your research? Anna Torv: I’m fascinated with personality disorders and how prolific they are. I’ve been reading a book about sociopathy and psychopathy, which said that currently one in 24 Americans are psychopaths. But they don’t all have blood lust, of course! That’s been my enduring fascination, because it’s incurable, and as you read more about it, and the tell-tale signs, you start spotting the traits in people you know or meet. Do you think that Wendy’s blunt straightforwardness is a reaction to working in a predominantly male environment – both at the university and at the FBI? Anna Torv: I know that because we’re set in the 70s and she’s working in a male-dominated sphere that that seems like it could be the case, but I actually think that whatever era she was born into she would be the same, because that’s just who Wendy is – she’s a brain. The same goes for her sexuality; I don’t think she would talk about her private life either way. Not only does she not have time for small talk, it exhausts her. What was it like to play a character like that – so refreshingly different to many of the female roles we still see today? Anna Torv: Her stand-and-deliver approach has been really interesting. It’s not that she lacks empathy it’s just that she’s not uncomfortable being incredibly dry. I think that women perpetually like to make people comfortable, so that was a challenge – like, ‘Oh wow, I’m not going to laugh at your joke; I’m not going to made you feel at ease, and I’m not going to excuse myself because I know I’m right.’ Channelling that energy was really hard, but inspiring. Anna Torv: It was so wonderful. Outside of the fact that it’s him, it’s amazing to have a director who’s also one of the creative producers because often you have to go through a bunch of people to make a change or discuss ideas, but because David is in both the writing room and on set, you have one person to go to; it’s director-led. As a result, the show feels tonally harmonious – nothing juts out or doesn’t fit. I think that’s the beauty of having a singular vision leading it, and then because it’s David’s vision, it’s incredible. Everybody raves about him to the point where it sounds sycophantic but it’s because he’s incredibly generous and because he knows exactly what he wants. He may do lots of takes but every time you do something, somebody gets a note, a nuanced adjustment, and as a result you stay alive and inspired; you try things you wouldn’t normally do. Because of that, everybody gets so into the work, and the motivation and energy is infectious.